Ever wondered how to get that really smoky flavour from aubergines? This recipe for Baingan Bhartha shows you how. Aubergine (baingan) is traditionally roasted in a Tandoor, however this simple and delicious recipe shows you how to recreate it on nothing fancier than a gas hob. 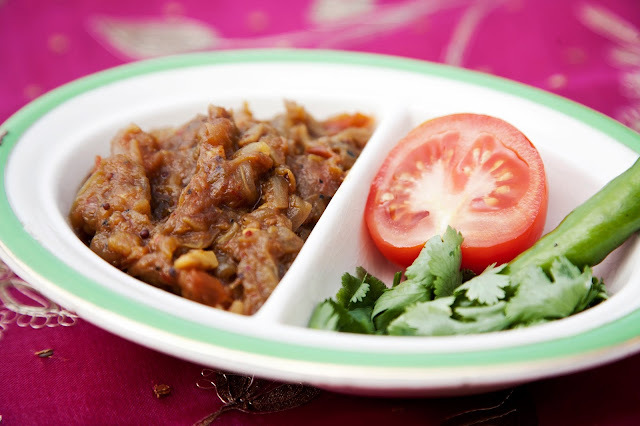 Combining a flame-cooked aubergine with garlic, onions, green chillies, tomatoes, fresh coriander and spices, this dish is perfect served with a few home cooked chapattis or naan bread, or as part of a bigger Indian feast. 1. Roast the aubergine over a gas burner on medium heat, turning regularly for even roasting. 2. Heat the oil in a pan, add the mustard seeds and sliced garlic. Stir for 1 minute. 3. Add the chopped onions and chilli, cooking for 3-4 minutes on a high heat. Stir continuously. 4. Add the chopped tomatoes and coriander leaves. Cook for 2 minutes. 5. Add the tomato puree, the rest of the spices and a large pinch of salt. Mix well. 6. Peel the skin from the roasted aubergine and mash the flesh. Add to the pan, cover and cook for five minutes over a low heat.